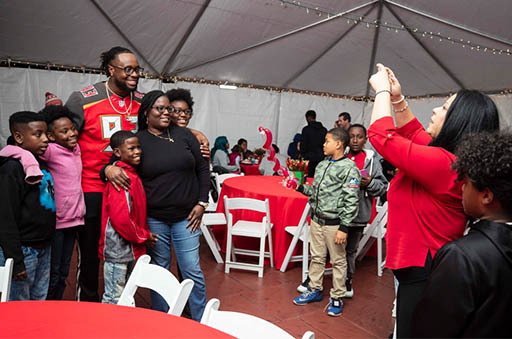 WASHINGTON, D.C. – Gerald McCoy has been named Week 14 NFLPA Community MVP for launching the Patricia Diane Foundation to assist single-parent households and hosting his sixth annual McCoy Family Christmas for 40 families in need. Named after his late mother, McCoy’s new foundation will focus its outreach on providing resources to improve the lives of single parents and their children in the Tampa Bay community. In doing so, he hopes to help them overcome the difficulties that he faced growing up in a single-parent household. The All-Pro hosted the charity’s inaugural fundraiser on Dec. 7, when he welcomed 100 guests, including several of his Buccaneers teammates, to the celebrity gala known as Patricia’s Mission Night. The live auction helped raise more than $90,000 for the foundation’s outreach programs, with McCoy personally donating $20,000 of his own money. Four days later, he and his wife, Ebony, held their sixth annual McCoy Family Christmas at the Buccaneers training facility. Forty single-parent families from the local community enjoyed a memorable holiday experience that included a festive meal, holiday music and decorated Christmas trees. Under each tree were gifts – personally wrapped by the McCoys -- from the families’ wish lists for them to enjoy on Christmas Day. While this month marked the birth of his foundation, McCoy has long been made an impact on his local community. Along with his annual tradition of renting out an entire movie theater and providing free tickets, popcorn and soda to families for a sneak preview of a superhero movie, he organizes an annual turkey dinner drive each Thanksgiving along with his defensive line teammates for families in need. In 2019, he plans to make regular visits to pediatric hospitals and hold a back-to-school backpack giveaway through his charity. In honor of McCoy being named this week’s Community MVP, the NFLPA will make a $10,000 contribution to his foundation or charity of choice along with an in-kind donation to him on behalf of our supporting partner Delta Private Jets. A limited-edition bobblehead will also be made of McCoy and sold by our supporting partner Forever Collectibles at www.foco.com. The NFLPA will donate part of the proceeds from this collector’s item to their charity or foundation of choice. McCoy, along with the other 2018 Community MVPs, will become eligible for this year’s Alan Page Community Award, which is the highest honor that the NFLPA can bestow upon a player.